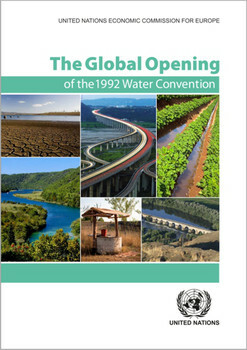 Brochure "The global opening of the 1992 UNECE Water Convention"
The Convention on the Protection and Use of Transboundary Watercourses and International Lakes (Water Convention) was adopted in 1992 and entered into force in 1996. It brings together almost all countries sharing transboundary waters in the pan-European region, and is expected to achieve broader participation with its global opening to all United Nations Member States. The Water Convention serves as a mechanism to strengthen international cooperation and national measures for the ecologically sound management and protection of transboundary surface waters and groundwaters. Furthermore, it provides an intergovernmental platform for the day-to-day development and advancement of transboundary cooperation. The present publication explains the obligations under the Water Convention and the way in which its institutional platform works, as well as the advantages for States to become Party to the Water Convention. It also addresses the relationship between the Water Convention and the 1997 United Nations Convention on the Law of the Non-navigational Uses of International Watercourses. The publication, which is intended for current and future Parties, international partners, non-governmental organizations and academia, aims to strengthen the understanding of the Water Convention and its global opening to all United Nations Member States. Download the brochure in English, French, Spanish and Arabic.